Involved in Motorsport or ride a motorcycle? Donate blood and want to display your group? 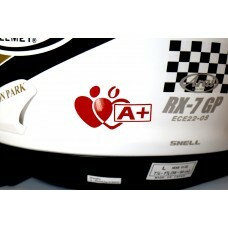 Our Blood type decal is an ideal way to alert others to your blood group. We suggest application to helmets (small size is best for helmets), but as with our other decals this sticker can be applied to any smooth surface. Don’t know your blood group? although this is unlikely if you are involved in competitive Motorsport; as you will have been tested at your medical, you can do something amazing and find out your blood group without having to give your GP a large 'back hander' for a full medical, Give Blood. Go to the Blood.co.uk website for more information. This decal is cut from a single colour, we recommend red, but the choice is yours, you will receive a pair (two) identical decals. Please choose your size, colour and blood group options from the drop down lists, if you have a rare blood group that is not listed please contact us and we will produce a range of decals for you at no additional cost.